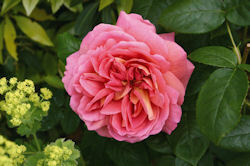 The repeat-flowering Rosa ‘The Endeavour’ (Ausdisco) from David Austin Roses features approximately 50 petals. With dark green leaves, the upper side of the petals is salmon-tinted, while the reverse is soft yellow. The growth remains compact even in the hotter areas — in fact, this is a variety best suited to the warmer U.S. regions (zones 5-9). It reaches 4×3.5 ft. as a garden bush or up to 8 ft. as a climber. The flower is named for the HMS Endeavour, commanded by Lieutenant James Cook. It carried the famous explorer on his first voyage to the Pacific Ocean where he discovered and claimed New Zealand (1769), Australia (1770) and a multitude of Pacific islands for the British crown.